For David the patients wellbeing is always the primary consideration. The contract for care comes with certain responsibilities on both sides. The federation for Independent Medical practitioners outlines the responsibilities of the patients (http://www.fipo.org/resources/rar-leaf.pdf). Mr. Johnson abides by the Good practice Guidelines and maintains the very best standards of care. The clinical outcomes of that care is audited annually. The resulting outcomes are exemplory and confirm that the care from Mr. David Johnson is of the very highest standard and safety. Mr. Johnson gives his patients up to 30 minutes for a consultation. This may vary to some degree. He does this because it is his opinion that patients need to understand the process of diagnosis, investigations and the treatment options available. Mr. Johnson subscribes to the Good Practice Guidelines and copies the letters to the GP also to the patients. 1 Treatment by a recognised specialist(s) with all the necessary expertise to care for you. 2 Treatment from the specialist of your choice. Your general practitioner (GP) or another specialist can help you choose the right doctor for you. Your choice should not be restricted by third parties e.g. an insurance company. 3 Treatment in an appropriate hospital on the advice of your specialist or GP, noting that some insurance policies place restrictions on certain hospitals. 4 Treatment in facilities that meet government standards and which respect your privacy and confidentiality, and provide all appropriate assistance (including the right to request chaperoned examinations) and can meet the specific needs that arise from your disability, ethnic background or other factors. 5 To see information and records kept about you provided doing so would not infringe anyone else’s legal rights. ensure the quality of care. 7 To have a timely and accurate assessment of your condition. effects and any alternatives to treatment and to have your questions fully answered. 9 To have a second opinion about your condition if you so wish. 10 To have the opportunity to comment about any aspects of your care and to receive a prompt response to any complaint made. a fair estimate of potential fees from your initial consultant which will include as far as can be ascertained potential charges for other specialists who may be involved in your care. It must be recognised that in many cases an accurate financial prediction is difficult to make, if not impossible, prior to a full clinical diagnosis nor is it possible to anticipate every potential clinical event that might occur. an estimate of potential hospital charges may be available from your consultant although for your own peace of mind these should be checked with the hospital concerned. You should also clarify whether the costs of an extended stay for clinical reasons are covered by any hospital package deal. a fully itemised account from the hospital, reflecting the terms agreed with the insurance company, if they apply. 12 To receive full reimbursement from your insurer for all treatment within the constraints of your particular policy. 13 To provide all relevant clinical information and other details necessary for your care to those entrusted with your treatment. 15 To tell staff if you are uncertain or do not understand any aspect of your treatment. 16 To take medicines as recommended and seek medical advice before stopping or changing treatment. consideration and attention to the needs of the child. 19 To understand the limitations, restrictions and exclusions of your insurance policy and to answer fairly and openly (with the help of your consultant or GP if necessary) any insurance company queries about your condition or anticipated treatment. 20 To understand that a contractual relationship exists between you and your doctors (including those clinicians who provide background diagnostic or other services such as anaesthetists, intensive care specialists, radiologists or pathologists) and also the hospital where you are treated. In some cases the hospital will make a direct charge that includes some of these services. You will not be charged twice. You have a separate contractual relationship with the hospital where you are treated. 21 To accept responsibility for the professional and other fees generated and for their timely payment. In the event that your insurance policy is not comprehensive then any financial shortfalls become your responsibility. If your policy has a specific excess (meaning that you are responsible for a proportion of the charges) then that may need to be paid either to the hospital or to the doctors treating you according to circumstances. 22 To give adequate notice if you are unable to attend an appointment and to understand that charges may be made for such visits if you have not given a reasonable notice of cancellation. 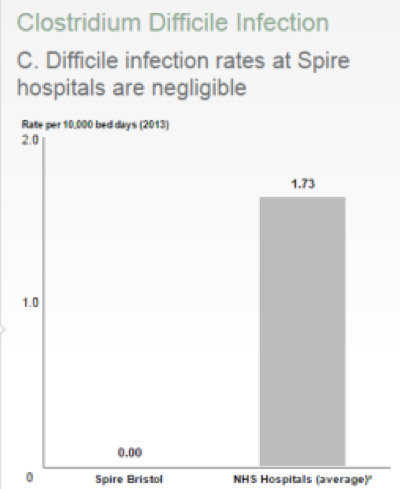 All Spire Healthcare hospitals have been registered with the Healthcare Commission (now the Care Quality Commission) and are required to meet the rigorous standards they set for independent hospitals. The standards include the quality and safety of treatment, cleanliness of the hospitals, staff recruitment and training and information available to patients. Before you have you your treatment with us, we may ask you to complete a survey about your general health, any pain you may have and how this limits your everyday activities. 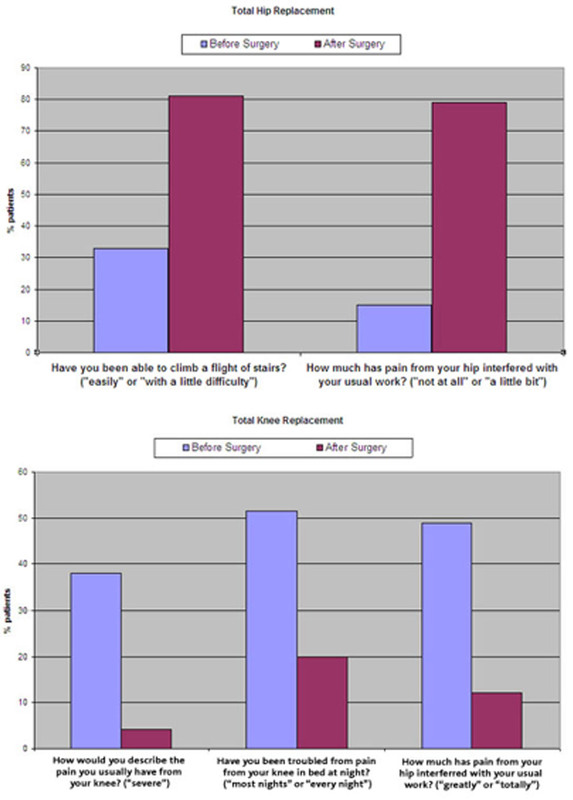 A few months following your surgery, we may then ask you to answer the same questions again. 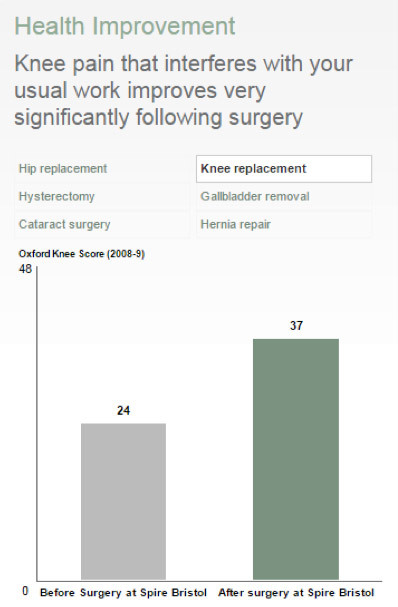 The results are then analysed and used to calculate the improvement in your health rating as a result of your treatment. 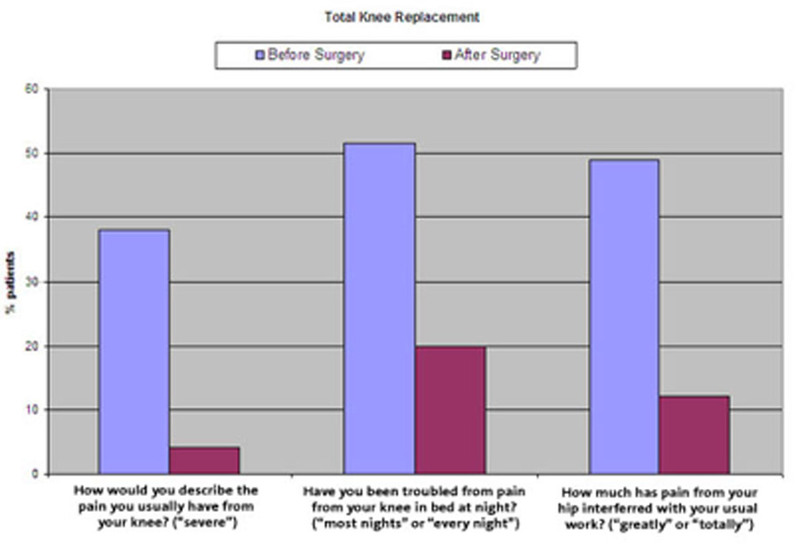 This is known as a Patient Reported Outcome Measure (PROMS). PROMS can be used as a guide to help you choose where you would like to receive treatment. They are also used to monitor and improve the quality of services our hospitals provide. 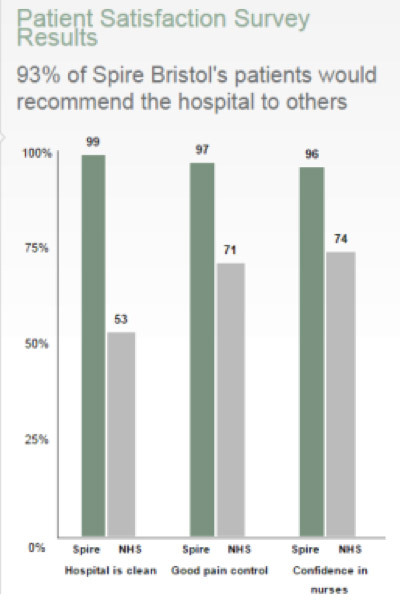 Spire patient satisfaction results are taken from the independent Spire Healthcare patient survey 2010. 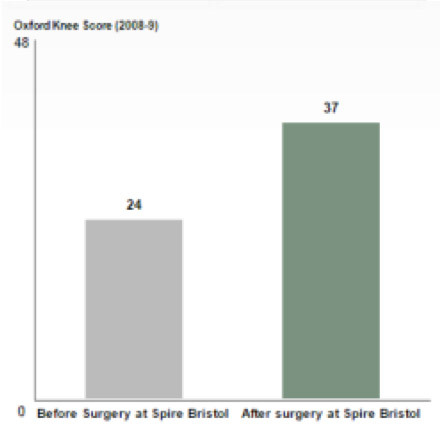 NHS results are taken from the NHS Inpatient and Daycase Survey 2008. MRSA is a type of bacteria that is resistant to some antibiotics. A healthy person can carry MRSA on their skin and it won’t harm them. 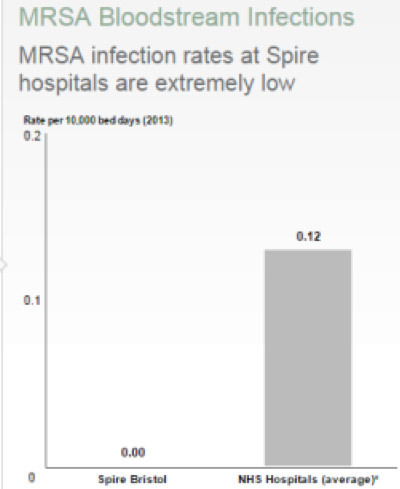 But if MRSA gets into the blood stream of a weaker person, perhaps if they have had surgery or are recovering from an illness, it can cause infection. MRSA can be treated with a range of different antibiotics in line with the national UK guidelines. Occasionally, you may need to return for additional treatment following your stay in hospital. Although this is sometimes unavoidable, our good discharge planning and the clear health information we provide helps to minimise the likelihood of this occurring. An unplanned re-admission is when a patient is re-admitted to the hospital within 31 days of being discharged. The reason for the second admission should be related to the first and will include an stay overnight on both occasions.